NBQA data show the beef herd is predominantly black-hided. While that’s no surprise, the surge in dairy breeds in the beef market may be. That background, provided by NCBA’s Beef Quality Assurance Advisory Board, outlines the basic philosophy around initial implementation and regular monitoring of the beef industry by the NBQA. NBQA’s premise is based on principles outlined by Edwards Deming – most notably, continual improvement requires objective, fact-based decision making. Data is requisite to making proper adjustments for improvement to occur. With that in mind, NBQA over the years has provided the industry some important and interesting insights into the industry’s evolution. 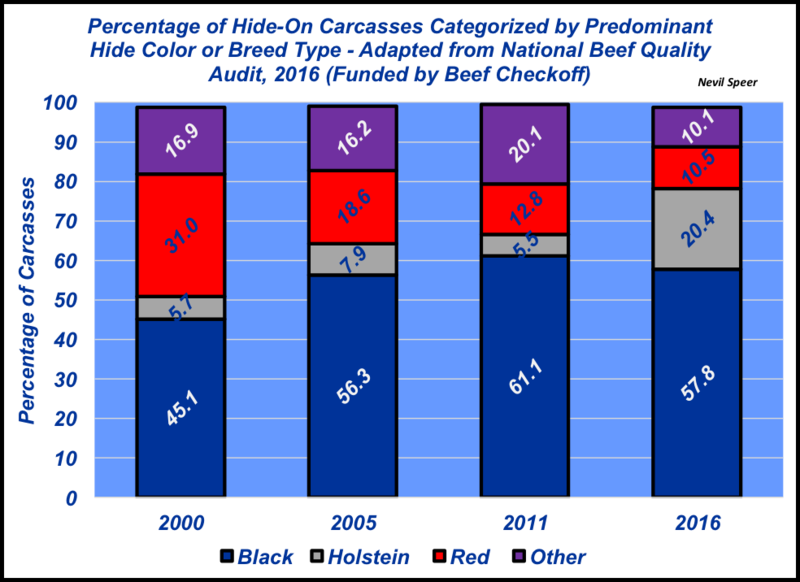 For example, this week’s illustration highlights the percentage of hide-on carcasses according to predominant hide color or breed type. The trend over time enables the industry to quantify general trends relative to the genetic composition of the fed steer and heifer population. The most recent assessment reveals no major surprises. That is, nearly 58% of the population possessed a black hide; that’s up sharply from just 15 years ago but relatively steady over the past 10 years. Meanwhile, the percentage of cattle that are predominantly Holstein is up sharply versus previous audits. The 2016 Holstein percentage corresponds to the general composition of the overall cattle population: the dairy cattle population is just slightly over 9 million head versus 31 million beef cows in the United States. How do these breed-type trends align with your general perception of the cattle population in the United States? Have you changed the genetic composition of your cowherd in the past 10 to 15 years? Where do you see these trends headed in the coming decade? Leave your thoughts in the comments section below.